I've had these pillows several months and I'm very happy with them. The covering is made of bamboo which is very sturdy which is said to be of higher quality than high count Egyptian cotton. The covers remove making it easy to launder. 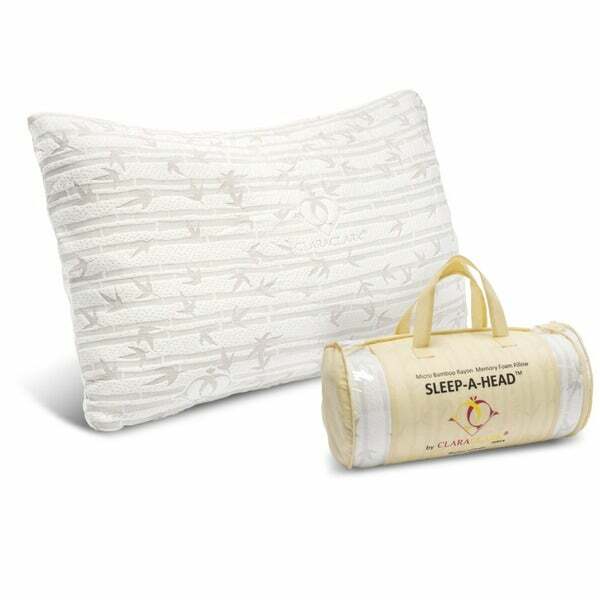 Get the peaceful, deep sleep you crave with this Clara Clark shredded memory foam pillow. Take this plush pillow along on vacations or business trips for comfort anywhere you lay your head, or use it at home for everyday comfort. its great and comfortable, its better than plain memory foam,everyone should get one,and then you can tell the difference between sleeping without pain,neck pain is gone.Nothing but pleasurable sleep. No more counting sheep,take it from me You deserve a Bamboo pillow. Overall I like this pillow, it supports my neck and does not get too hard. You do need to fluff it each night before you lay down. love it. I sleep great. i never knew what a pillow could be, until this pillow came into my life. Wow, not just wow, but WOW! My Angela (love of my life) was born with two fused vertebrae in her neck. She aways has pain or serious discomfort. As a registered medical assistant (RMA) in a very busy practice she’s always running around (just ask her iWatch keeping track). But a couple hours a day she’s stuck in front of a computer scanning records, entering digital charts, etc.. Her discomfort every day is almost unbearable. I recently read about Bamboo memory pillows, after reading reviews I decided to purchase these four (King) pillows . I can only say wow! They arrive all squished and rolled up. It takes several hours to regain shape. I am happy I got four, because they are memory foam they cradle your head (perfectly). But during the night you might want to flip them or change to the other to get it fluffed back up. They regain shape quickly They are not going to make your head hot. They have a neutral aroma, plastic smell. Highly recommend these!! Love sleeping with this pillow!! I do not need to plump, fold, or adjust this pillow. Much cooler than a regular pillow and gives excellent support. If you are looking for the perfect pillow for a great nights sleep try a Bamboo Pillow. Shredded memory foam sounded like a great idea but feels like a rock. Sure, you can fluff it and change its shape after you spend an hour or more breaking apart the stuck together lumps (even after allowing the pillow to expand on its own for the recommended time). However, once your head sinks in, the foam compresses and gets stuck in a shape and is difficult to readjust in the middle of the night without completely waking up to do it. I returned these. I love these pillows!!! It took a few hours for them to plump up to their original size from being in the packages,and they are a lot thicker than I expected. They are very comfortable,however they have an odor...I hope it goes away eventually-it’s not as strong now as the first night. After sleeping on them a few nights,I find I’m more rested In the morning. I would recommend them if you like a thick pillow. They do have zippers so you could remove some of the filling to make them flatter if you wish. Overall,a great buy! This pillow feels really good. It fluffs back to its original shape every time. It is a bit too thick for the space between my neck and shoulder, so it may fit a larger person better. I love that it has a removable, washable cover. I bought one of these pillows for nearly twice the cost at a Holistic Wellness fair. After sleeping on it for a few nights, I am totally in love and will sleep on nothing else. I ordered several more from Overstock and love the price. The foam is a little firm, but I find it so much more relaxing than goose down and I love propping myself up in bed to watch TV. Foam contours to your body! Such a restful nights sleep. No more neck pain or snoring from the hubby! Order was messed up from the start. First shipment ended up being mattress covers, not pillows. Went online to chat to get help in returning and reordering but that ended being a big mess. Once I called CS, service was the best and the return was a breeze. This was advertised as soft, but feels pretty firm. Felt like a block a clay that molded around my head. It had a zipper to access the foam. I removed some, now much better. GREAT PILLOW...SOFT, COMFY AND EASY TO MAINTAIN!! LOVE OVERSTOCK....GREAT CUSTOMER SERVICE AND DELIVERY! After reading many reviews I decided on this pillow. I am a side sleeper who turns into a stomach sleeper. Hard to find a pillow that suits both needs. For the first few days I was having trouble with how hard and full this pillow is. You have to adjust it quite often to find your comfort and who wants to do that all night, plus it felt hard. So I was going to look for another pillow. Well I thought for a minute and decided why not take some of the stuffing out. Took out about 1/4 of the stuffing and to my amazement the pillow fit my needs perfectly!!! Turns out it's a perfect pillow that just needs to be adjusted to one's needs. Look no further, this one works for all sleepers!!! These pillows are fabulous! They have retained their shape and softness very well. I slightly fluff them each morning when I make the bed, but they don't require it. They have not become hard. The odor that others have complained about completely went away in a very short period of time. I room aired them after unpacking them before use, and that may have helped. They don't retain heat and they cradle the head and neck, no matter the sleeping position. I looked at tempur-pedic pillows but the price was obscene. These are a terrific alternative. I have always had an issue with pillows. Received these and used them the first night. Probably should have allowed them to sit for a day or so. They seem firmer than I am used to but I am a side sleeper and I didn't wake up with a neck ache. So I think they will be fine once I get used to it. "Does this pillow need to have a pillow case on it, or is it supposed to be used without one?" Needs a pillowcase. Standard size fits. I am small built and regular size pillows leave me with a sore, stiff neck. I need a soft pillow that will almost go flat when I lay on it. This is the 5th pillow I have purchased in the past month. I hope it works! "Does this pillow have the cool gel to it?" Hello Catt5422, thank you for your inquiry. Unfortunately, the information you have requested is currently unavailable. You will receive an email notification once an answer is posted. Have a great day.